...why do we do such strange things? Eat pate - not paste out of a jar, but pate out of a pack. Because pate is posher. And what is the difference between pate and paste? Pate has lumps in - sorry, texture, I mean to say "it's textured". Textured with little chunks of fat that gross you out despite the many other things you've already engorged on over the Christmas period. But you still eat it. Eat too much chocolate - for eleven months of the year, there isn't such a thing as too much chocolate. I could happily devour one of those large bars of Cadburys in a single sitting without batting an eyelid. But at Christmas? Suddenly some kind of "chocolate limit" kicks in, and despite the piles of tasty-looking Roses and Quality Street sitting there, all I really want is a cracker. Weird Digestive Crackers - speaking of crackers, what is the deal with those strange digestive-type crackers that you get in boxes of crackers? They're like a digestive biscuit, and kind of sweet which really messes up the taste explosion of the cheese piled upon it. 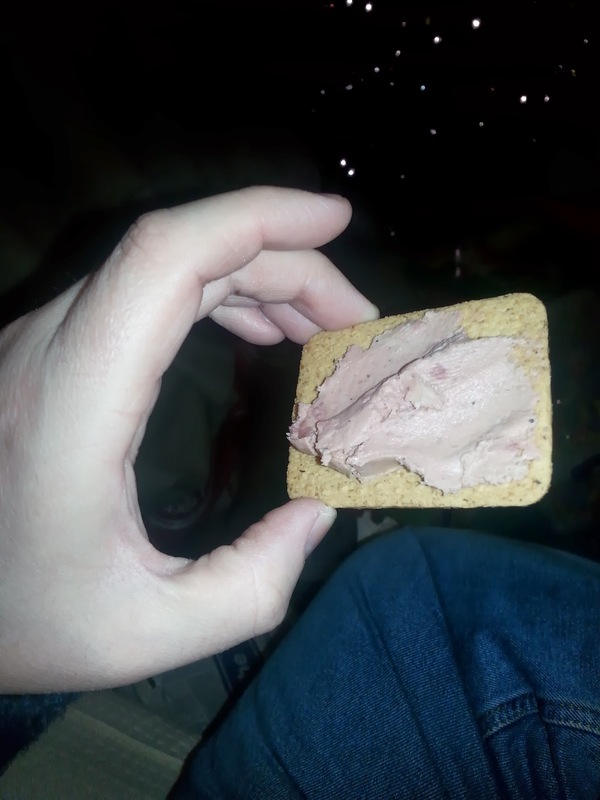 Weird digestive cracker AND lumpy pate?!? Ring people at midnight - this doesn't happen so much now that I'm getting older, but we ring people at midnight on New Years Eve, to wish them "Happy New Year". This is often made more difficult by the fact that one, or both, parties may be at some kind of social event (be it a party at home, a night club, or a bowling alley) so hearing someone on the phone isn't easy at the best of times. And because so many people are ringing or texting "Happy New Year" all at the same time, the phone networks crash. Ringing people at midnight is odd, isn't it? If anyone rang me at any other time of year at midnight, I'd assume someone had died or was in hospital, or at the very least had got the wrong number and really wanted a pizza delivering asap. Eat Danish Butter Cookies - I don't actually mind eating them that much, but I wouldn't buy a tin myself. Except at Christmas, when one (if not two) tins of butter cookies appear in the house as if by magic. Gold Chocolate Coins - At any other time in the year I could see myself struggling to remove a minute piece of chocolate from a foil casing, because I eat stuff that's bad for me. But when do we get them? At Christmas. When the house is already full of chocolate and other sweeties. You can always tell that you're out of all other chocolate when you start on the gold coins, and when you do resort to the chocolate coins you'll start with the biggest ones, the ones that look like a big two euro coin, because you get more chocolate for the effort spent penetrating the foil. But all too soon you end up with just a stack of small, old five pence sized chocolate coins left, and the misery that settles around you as you work your way through these builds up to replace the depression thrown off at the beginning of the holidays. While I'm blogging, I have a new video uploaded to my YouTube channel - my son loves counting and spelling songs, so I made a counting video, and used a xylophone to provide the tunes. Mike- so I have finally recovered from the laughter. That counting video should be a requirement for all children. Pate is gross. I love Cadbury! Cheese is always appropriate.Gold coins are scraping the bin! Loved this post!